We arrived into Ravello yesterday afternoon before sunset. 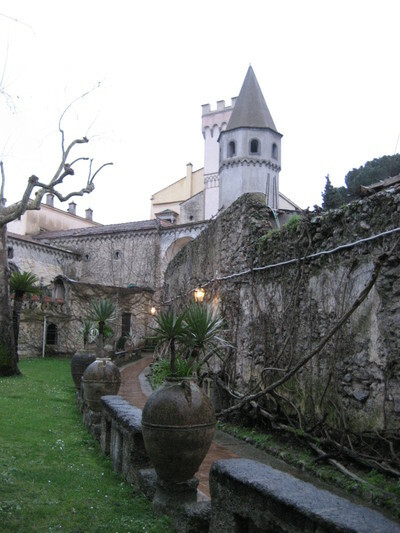 It is only about 5 kilometers uphill and inland from the town of Amalfi. We checked into the Hotel Graal (Via della Repubblica, 8 – tel: +39 089 857 222), which appeared to be recently refurbished, and were quite happy with our room with a view (#344). This was the smallest (approx. 2500 inhabitants) and the quietest of the villages we visited on the Amalfi Coast, and we weren’t sure that there would be enough to keep us busy on our short stay. We were even more worried about finding restaurants open – food and wine always being our number one priority wherever we go. The restaurant situation proved to be a bit challenging, although I think we fared pretty well. Our favorite meals included dinner at Villa Maria and lunch at Hotel Parsifal, both with beautiful views overlooking the Amalfi Coast, and both are places we would consider staying on future visits to Ravello. It turned out that we had enough to keep us busy for the day, starting with a visit to Villa Rufolo, the gardens of which were the inspiration for the German composer Richard Wagner’s “enchanted garden of Klingsor” in his composition of Parsifal in May 1880. 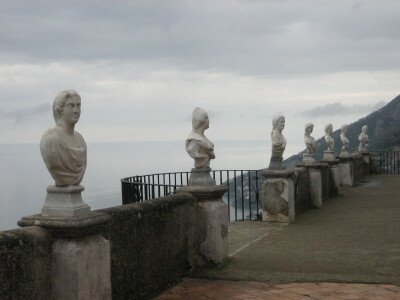 These are the same gardens that play host to the Ravello Music Festival each summer, with a stage that is extended out from the terrace grounds, appearing to be suspended over the water, so that as you watch the concert, you have the beautiful gardens in front of the orchestra with the stunning sea view as a backdrop. In the afternoon we visited Villa Cimbrone with its Arab-Sicilian-Norman style cloister, its Gothic crypt, its Doric temples, its domed gazebos, its expansive gardens with lovely pergolas and beautiful sculptures, including a glass-encased marble sculpture of Eve by Tadolini, which is placed in a natural cavern called “Grotto di Eva”. 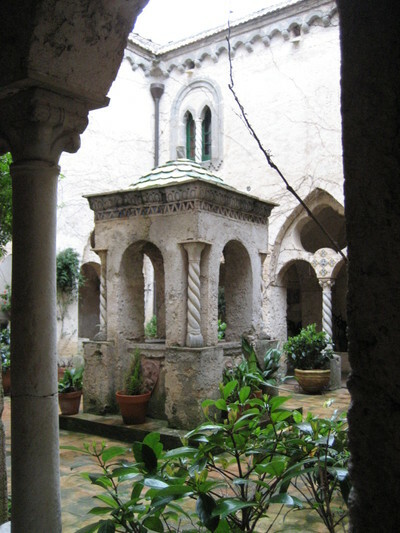 With all the beautiful architecture, bas reliefs, sculptures, and flora, this palazzo situated on its perch with commanding views of the sea and the Amalfi Coast from very every angle, must have inspired the works of many of the creative people who, at one time or another, made their home here. Such a list includes the names of E. M. Forster, Virginia Woolf, D. H. Lawrence, Greta Garbo, Lytton Strachey, Henry Moore, etc. 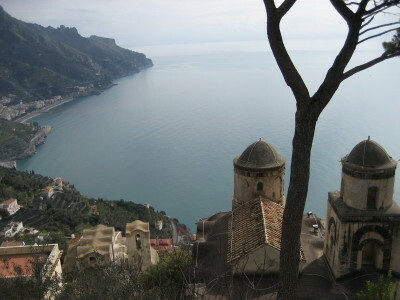 One thing we would like to have done, but didn’t have time for today, was a hike to the town of Amalfi. We saw a path with a sign marked - Amalfi 5 - but because of the rain and the late hour, we didn’t think we could make the 10-kilometer roundtrip before it got dark. 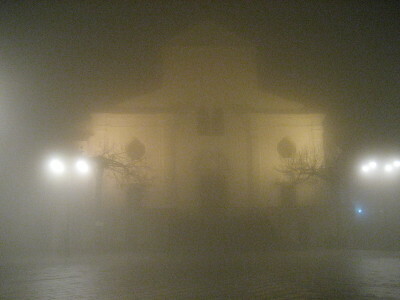 Our walk home tonight, after a most unremarkable dinner, was pretty spooky with the pouring rain and the thick fog obscuring the breadcrumbs we left to find our way back to the hotel. One false step off the steep walkways could have been the end of us. As we passed by the Duomo, I remembered that the blood of Saint Pantaleone is conserved inside, and each year on July 27th, the day of the Patron’s feast, his blood miraculously liquefies. Fortunately, we made it back safely and soundly and without incident. What awesome fog! Great photograph.